Ragsdale Heating, Air & Plumbing provides Woodstock, GA with dependable heating, air conditioning and plumbing service. Our plumbers and heating & air conditioning pros are able to help with just about any plumbing or HVAC issue you're experiencing in your home. Wheather it's a small leak, a clogged drain, a broken down furnace or air conditioner in need of a tune-up, we can help. With our dedication to quality and a 100% satisfaction guarantee, you can rest easy knowing you made the right choice when calling Ragsdale! Heating and cooling system problems can be a real hassle. When the furnace, air conditioning or heat pump in your Woodstock home stops working, we know how stressful it can be. But one call to Ragsdale can get you on the fast track to restoring your home comfort. Our HVAC experts can repair air conditioners, furnaces and HVAC systems of all makes and types, and we'll make sure you completely satisfied with our work. With flat-rate and upfront pricing, you will get an accurate diagnosis and a firm quote for any of our heating and air conditioning services. You’ll know exactly how much you’ll be paying before any of the work begins in your home. We have the best warranties available to make sure your HVAC system meet the comfort and needs of your family. Our heating & air conditioning technicians receive ongoing training, ensuring your HVAC repair, service or installation is performed right the first time. Our team will always bring an attitude of confidence and integrity and make sure you are well taken care of. Our plumbers are ready to help with any plumbing issue you may be suddenly experiencing in your home. We have been serving Woodstock for more than 20 years and have seen all types of plumbing issues. Our plumbers will perform a thorough examination of your plumbing issues and take the time to help you understand all your repair or replacement options. We understand your time is valuable, and our plumbers strive to arrive within the scheduled time frame. When you call us you can count on our licensed and experienced plumbing experts to deliver exceptional service. Our plumbers will be able to diagnose and repair the plumbing issues in your home. You can count on us for quality service and know that we will work hard to ensure your complete satisfaction. 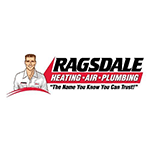 “Our plumber from Ragsdale was prompt in getting to my home. He assessed the needed work. Gave me a price estimate. Once I approved it he and his partner went right to work and completed the job of installing a new water heater in less than 2 hours, as well as increasing our water pressure and repairing a leaking shower drain. I appreciate the great service that Ragsdale provides!” – Trad H.